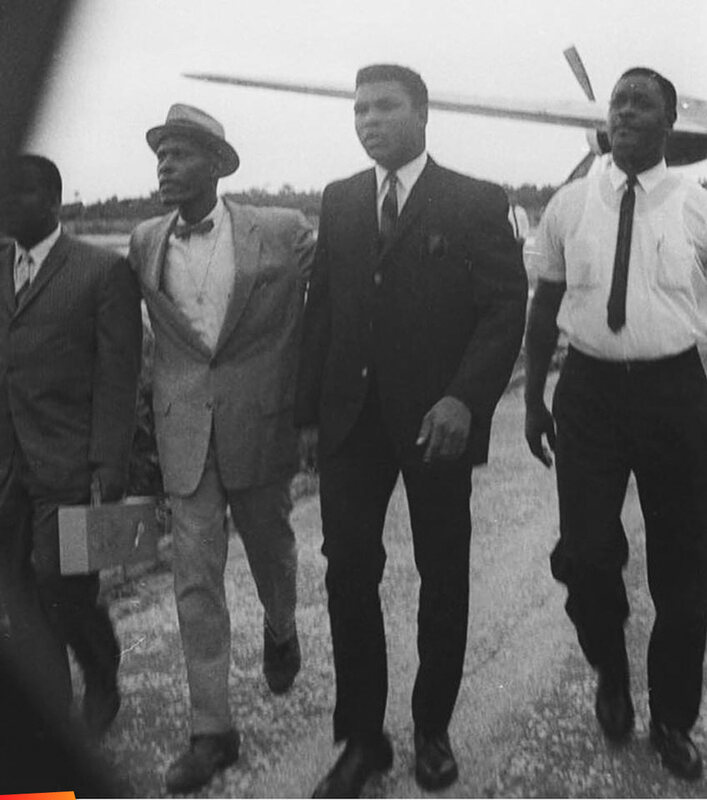 Muhammad Ali (Cassius Clay) visited Belize on July 24th 1965. 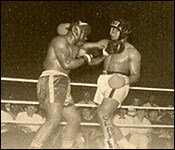 He and his sparring partner Cody Jones did a public exhibition match at the Palace Theatre. 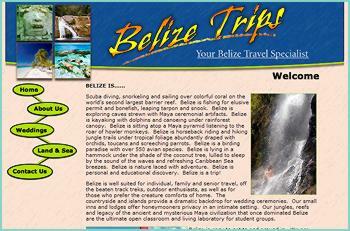 "Mohammed Ali came to Belize in July of 1965. 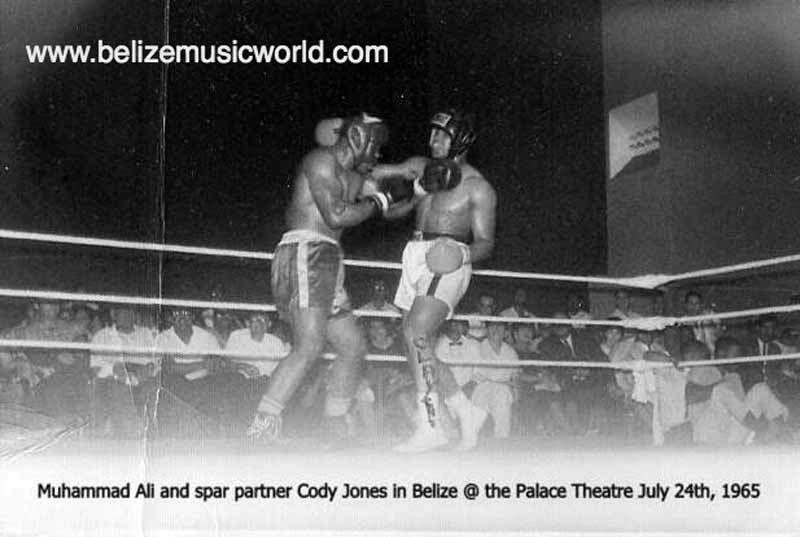 He didn't box anyone in Belize, he brought down a sparring partner and his name was Cody Jones. He did some performances at the Palace Theatre where a professional ring was set up, they had ring-side tickets and everyone just crowded to see Mohammed Ali in action at the Palace theatre where he did the shuffle and showed how fast his hands were. Basically that's all it was, an exhibition. I was 9 years old and at ring-side both nights. What I do remember clearly was either one of the nights, he also had a matinee and I think this happened at the matinee, there were a whole bunch of children outside but they couldn't afford, even though at that time it was a small admission, to see Mohammed Ali. Funds, of course which was going to him, the other promoters that made the contact with my father and Mohammed Ali said 'open the doors and let everybody in free, all the kids'. He had a microphone when he spoke to the audience and said that when he was a kid he could not afford going to such a boxing event so he wanted to share him being here with all - one and sundry. He was a great man, he came to Belize and people at ring-side were such as Net Vasquez, Dean Lindo, Joe Carrillo, The Hunter Brothers, Mr. Clive Tucker who worked for my father and his wife Ms. Veronica Tucker." "Did you follow up in the years afterwards, catching up....?" "Oh yes I'm a Mohammed Ali fanatic. I have seen anything and everything there is to see about Mohammed Ali. In fact I'd like to suggest to you and the viewers to watch one of the recent ones that came out on Netflix called 'I Am Ali' which is one of the newest Mohammed Ali documentaries. Indeed I have followed his entire life and was really shocked when I heard the news of his death on Friday at really the young age of 74. My mother is 82 and strong as can be. 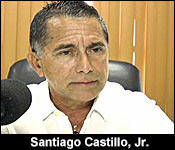 Mr. Net Vasquez who was around at that time should be around 85 strong as can be." 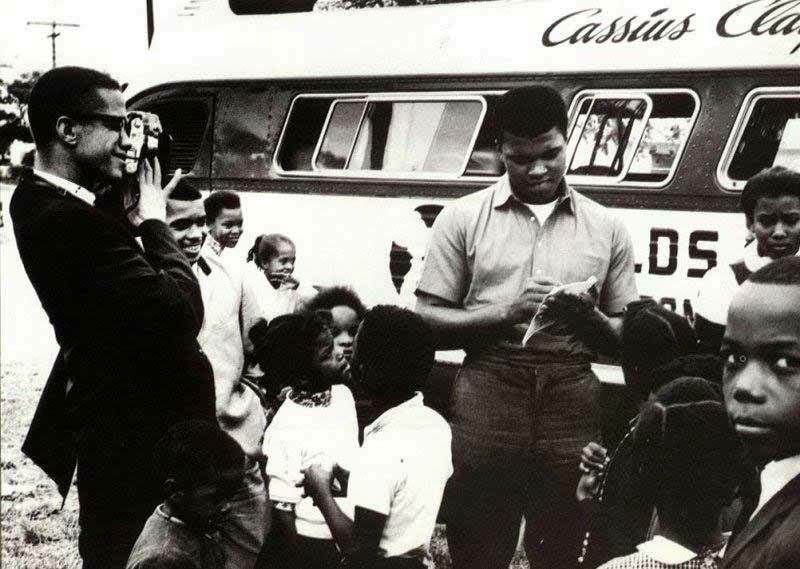 Ali - then Cassius Clay - hosted at least two exhibitions at the Palace Theater, and legend has it that in the daytime show for children, he convinced the promoters to let all the children in for free. From racist Middle America in Louisville, Kentucky a black boy who rose to become a global iconic figure as a result of his unparallel athleticism, self- discovery and social/political defiance in the face of white supremacy, died on Friday, June 3rd, 2016. Muhammad Ali, who won the Olympic gold medal for boxing in the heavyweight division and then went on to capture the world title an unprecedented three times, defined an entire generation and became a voice and symbol against racism, injustice, oppression and global imperialism. As we are inundated with various mass media coverage of the passing of Ali, once again we are witnessing that even in death someone else controls the narrative, which in many respects represent the unfinished work and challenge still facing the black liberation struggle in this third millennium. There has been a disturbing pattern in the past few years where the very forces to which our giants waged struggle and resistance against, ended up influencing the affairs of their image, works, interment and legacy. This may appear to some as unimportant; however, if we continue to allow others to frame our historical narrative, tell our stories, then the authenticity and poignant truths will continue to be distorted and lack the propensity to empower and inspire our children and future generations. In January of 2006 when civil rights leader Coretta Scott King, the wife of Dr Martin Luther King, Jr., died, one of their closest comrades and supporters in the early struggle, entertainer Harry Belafonte, for political reasons was prevented from speaking at the funeral. Meanwhile, several others who had nothing to do with the civil rights movement or support of King’s work, George Bush and Bill Clinton, were accommodated. In South Africa when Nelson Mandela retired from office, a foundation virtually ran and controlled his every word, image, papers and life to the point that his daughter had to publicly lash out after his own family had limited access to their father. In the end, a giant revolutionary figure was almost reduced to a caricature far removed from his true legacy. Many of the same people who represented the forces Mr. Mandela struggled against and sacrifice his entire life to defeat, dominated and basked in the limelight at his funeral. In the case of Che Guevara, Hollywood made two movies on the life of the Argentinean. But they only focused on his early years before he met Fidel Castro and was transformed into a global revolutionary leader. The same scheme has been use on the image of Malcolm X, Dr Martin Luther King, Jr., and several others too numerous to mention. International Pan Africanist and black power advocate Stokely Carmichael, aka Kwame Toure, was an exception. Carmichael, who knew he was dying, remained in control of his life and works by collaborating with the author of his biography and chose to die and be buried on the African continent in Conakry, Guinea. Indeed, Carmichael had followed in the footsteps of his predecessors, Dr. W. E. B. Du Bois and George Padmore, both of whom had chosen to be buried on the African continent in Ghana. In addition, the great conscious reggae superstar, the legendary Bob Marley, who died in a Florida hospital, had a Rasta interment with reggae music blasting at the service and was buried in a small village in rural Jamaica where it had all begun. Eventually, the Marley family had to do battle in the courts to maintain control of the icon’s voluminous work and image. Muhammad Ali is a special case because in 2006 Robert Sillerman, the chairman of Core Media group, formerly CKX that specialized in intellectual property, purchased 80% of the marketing rights to his name and iconic likeness for $50 million. According to Forbes, Sillerman’s net worth is around a billion dollars. As a consequence Core Media group now has considerable influence over the champ, even in death. Core Media’s reverberation and impact has already been felt with the selection of who will give the eulogy at Ali’s funeral. In light of what Muhammad Ali life represented, it came as a shock to many in the black and progressive communities that former President Bill Clinton was announced to make such delivery. Clinton has close ties to Sillerman, whose company has made major financial contributions to the Clintons’ foundation. The repackaging and image makeover of Muhammad Ali’s human rights struggles has been under way for some time now. No major, powerful black leader has been asked to speak at Ali’s funeral. In the 1960’s the Nation of Islam under the Hon. Elijah Muhammad became the most influential black mass organization in North America. Many were impacted by the NOI’s unique approach to spiritual awakening, self-love and economic empowerment. 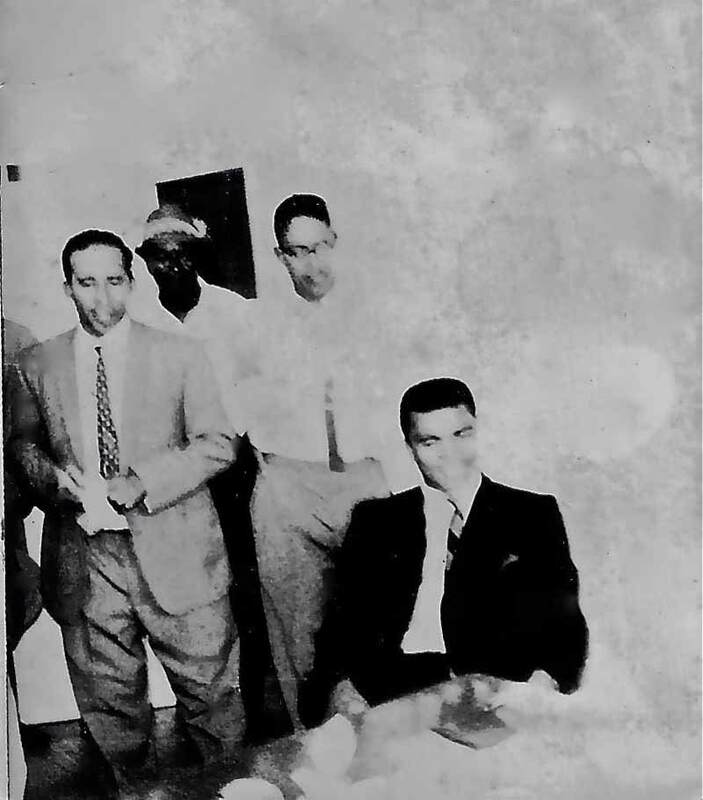 The young man formerly known as Cassius Clay came in contact with the NOI while training in Miami, Florida. Clay, who eventually studied in the Nation and met his teacher Elijah Muhammad, was transformed from a mere boxer into the iconic Muhammad Ali. No longer just an athlete, he became self- aware, spiritually grounded and fearless, just like another famous student of Elijah, Malcolm X. The mass media continues to try and separate Muhammad Ali from his teacher, However, there would be no Malcolm X, Muhammad Ali, and Louis Farrakhan without Elijah Muhammad. When Muhammad Ali was stripped of his world boxing title and prevented from fighting and making an income, Elijah Muhammad made Ali a “minister” of the Nation that helped to facilitate Ali’s ability to tour the world on speaking engagements on college campuses where he was paid. He never disrespected his teacher and mentor, the Hon. Elijah Muhammad, who bestowed upon him the name Muhammad Ali which he proudly kept and defended to the very end. 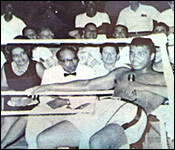 Ali, Min Malcolm X and Min Louis Farrakhan were all very close friends and associates during his time in the NOI. 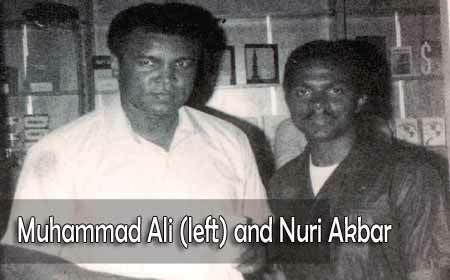 He built a strong relationship with Elijah’s son, Imam W. D. Muhammad, who succeeded his father and remained active within the predominantly African-American Muslim community after his retirement from boxing. It was there that I had the privilege of meeting Muhammad Ali. The first encounter occurred at Masjid Felix Bilal in South Central Los Angeles where Bro Ishmael Shabazz and I were visiting. The Masjid was virtually emptied and Ali was alone and had just completed his prayers. We were not shocked to see Muhammad Ali in the Masjid; after all he is a practicing Muslim. But I was in awe because I knew I was standing in the presence of a living legend and greatness. He was friendly, funny, and yes, very humbled. He has a natural affinity toward the youth. I was 22 at the time and he took us outside in the back yard of the Masjid and began to do magic tricks. He told us to look down at his feet and he did a trick that gave the illusion he was floating off the ground, among several others. After a while we went back inside to an office where we chatted for several more minutes talking about Belize and the fact that he had expressed an interest in visiting the country again. 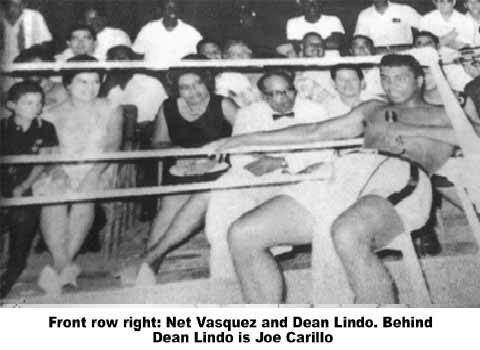 Ali had first visited Belize in July of 1965 as world heavyweight champion where he met and did exhibitions for the Belizean people. I asked him some informal questions which were used in an article that was later published in the Amandala newspaper and the Belizean Focus, a newsletter that was published by the Los Angeles Muslims of Belize. Muhammad Ali was not yet showing any visible physical effects of Parkinson’s disease which were attributed to his career as a boxer. I found out later that during this period Ali was living in Los Angeles in the mid Wilshire district and would visit the various Muslim activities in and around the city frequently. It was at another Muslim event at a local high school auditorium where Imam W. D. Muhammad was the scheduled guest speaker that as fate would have it Ali and I met again. I and Bro Shabazz arrived at a packed auditorium where we were fortunate to find two seats not too far from the front where the Imam was to make his address. While seated, for some reason Shabazz left his seat and disappeared into the crowd. Some moments later a man came unassumingly and sat next to me where Shabazz had been sitting. When I turned slightly to see who it was, there seated was the legendary Muhammad Ali. The organizers of the program on the podium surrounded Ali and tried in a futile attempt to get him to leave and sit on the stage, but he refused to leave and remain seated next to me for the duration of the event. Ali wanted to remain in the audience with his people. What followed gives a glimpse of the funny personality and almost childlike side of the greatest athlete that ever lived. Ali stung me behind my ears several times and then pretended that it wasn’t him when I turned to look. He was jovial, down-to-earth, and talkative, and yes I even remember the Lifesaver candy he offered me that he was eating. It was difficult to focus on the actual event itself taking place and having a man who literally destroyed some of the greatest fighters in the ring, engaging you in such a way. In those moments, Muhammad Ali’s authenticity, humanity, humility, self-assuredness, and heart illuminated, and is a signature reflection as to why he was so loved by so many all over the world. My final encounter with Muhammad Ali occurred several years later when the effects of Parkinson’s had begun taking a toll on his physical mobility. In 1992 Ali’s biography, his life and times, by Thomas Hauser was published. I attended a book signing event by Ali which was held at the legendary and popular African-American book store “Eso Won” in Los Angeles. This time I was accompanied by Bro. Nuri Muhammad and Ishmael Shabazz. It was a delight to see and meet the champ once again, but equally heartbreaking to see the once mighty gladiator fighting his greatest struggle yet. As I approached the table for him to sign my copy of his biography, the champ, with shaking hands and unable to speak, slowly wrote his signature on the page in my book. Suddenly, he looked up and for a brief moment there was a flash on his face with a smile, and he made a gesture with his hand pointing at an animated Shabazz. The champ had recognized Bro Shabazz’s face; it was a beautiful and poignant moment of recognition, love and brotherhood that stayed frozen in my mind to this day. Much respect, my brother: you set the bar high in the stratosphere and while doing so you never lost your soul. Permit me to add a few words to the account of Muhamad Ali’s visit to Belize. The evening he was a guest at the Newtown Club he would not have any of the liquids available. My wife Laura went to our home, then at Newtown Barracks, and brought equipment and materials necessary to brew tea and coffee. I can’t recall which “The Greatest” had but do remember him contentedly sipping away. My friend Dean Lindo may remember the incident.